As part of a tree planting campaign, 120,000 olive trees are being planted in Pakistan’s Balochistan province. Half of the new saplings to be planted were grown in nurseries on-site while the rest were imported from Italy. The olive plantation will cover a total area of 14,000 acres (5,665 hectares) in Balochistan, Pakistan’s largest province in terms of area, which is located in the south-west of the country. The recent olive tree planting drive is part of a campaign launched by the Pakistan Agriculture and Research Council (PARC), an agricultural research organization based in the capital Islamabad. The project is part of ongoing efforts to transform barren land into cultivable plots and promote the province’s agricultural sector while introducing alternative crops for local farmers. There are also plans to build a new olive oil mill in the provincial capital Quetta. Meanwhile, in Pakistan’s northernmost region, the government of Gilgit-Baltistan has announced plans to plant three million olive trees within a period of three months as part of an environmental conservation project. Parts of this region have experienced deforestation and negative environmental effects like soil erosion, landslides and flash flooding. Under the supervision of the forest and wildlife department, students of local schools and colleges are being encouraged to participate in the drive by planting olive trees. Pakistan is not a traditional olive-producing country but a wild subspecies of the olive tree called olea cuspidata does grow in different parts of the country. Since 1986 olive trees have been planted experimentally, starting with a project funded by the Italian government. 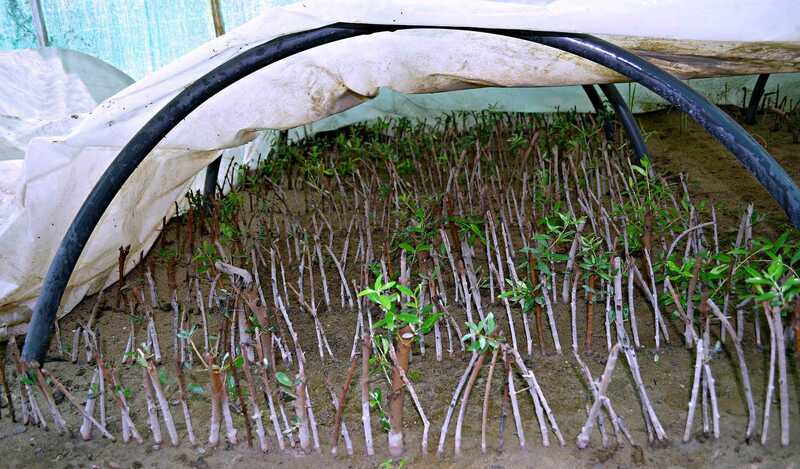 Another government project to plant over five million olive plants was unsuccessful when only one percent of the saplings survived. However subsequent planting drives have borne fruit. Similar projects implemented in several provinces throughout the country aim to promote olive cultivation and increase the production of edible oils. They have included training programs for local farmers in olive cultivation, processing and pest control, and the setting up of oil extraction mills. The Pothwar region in the northeastern corner of the country is being developed into an “olive valley” after being identified as a region suitable for olive cultivation because of its topography and climate. Under a current five-year project running until 2020 and also managed by PARC, 2.4 million olive trees are being planted there as a cash crop. Olive oil is already produced in Pakistan along with a number of other products for sale on the domestic market like olive jam, chutney, pickles and olive-derived products like olive syrup, olive vinegar, olive sweets and olive tea.